There’s much more to collecting historic glass than bottles, cup plates and household pieces, and going past those, it gets rather interesting. Having gone out picking, I found a most interesting piece, a solid and heavy tubular glob of glass, quite cylindrical in form measuring 4″ long and 2-1/4″ diameter. 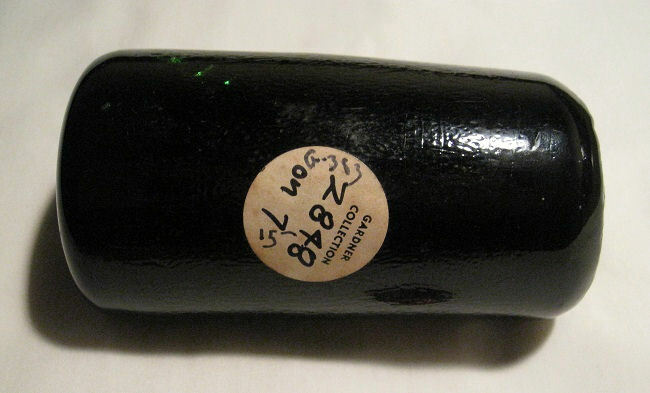 I knew from the very historic auction sticker that it was sold in 1975 when the most famous of collectors, Charles Gardner, sold his entire collection at Skinner’s Auction. But, what exactly is this piece? 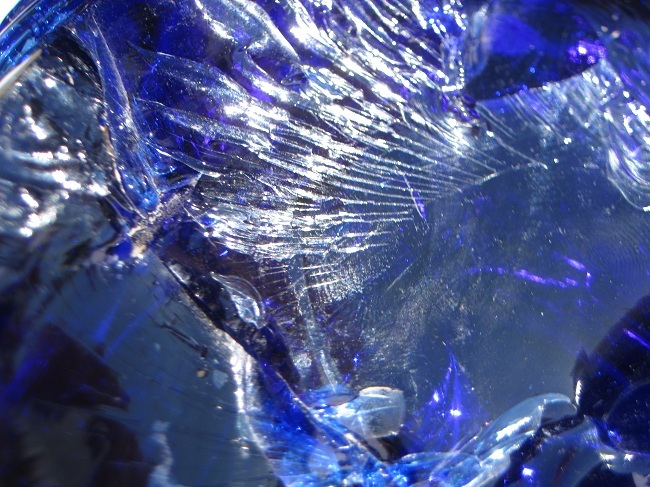 I had been under the impression that due to it’s shape and size, that it was a “blob” or “gather” of glass that the Gatherer had pulled from the glass batch, and rolled on the marver, which is a wet wooden table he used for shaping, before handing off the piece to the Gaffer, (the lead blower,) who would blow the solid piece into a bottle. Under this impression, I noticed the broken off rod area at the top and hypothesized that this piece was an “unblown” bottle that for some reason or another, was not used, and set aside or discarded, and possibly dug from the ground of an old glassworks. 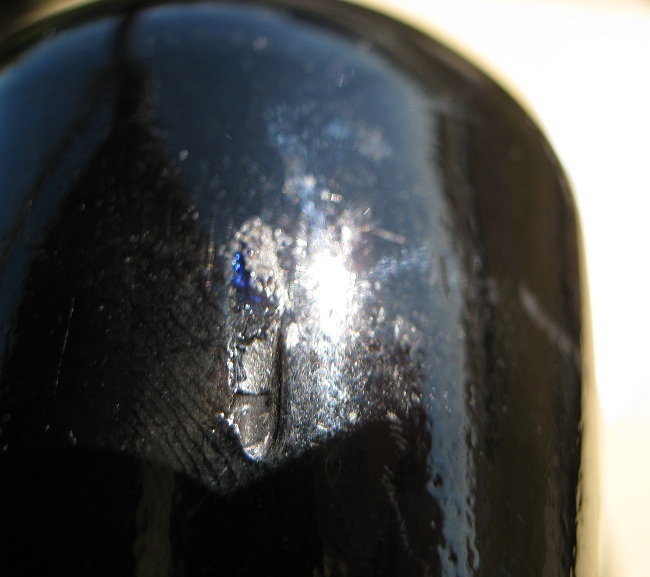 Note in the picture below, the rod break, or pontil area, on the top; also note the deep emerald green seen in the thinner areas of the glass. I have since acquired another similar example just yesterday. Still under the “unblown” bottle impression, I thought the same about it. It’s a tad longer and thinner, yet the characteristics are very similar if not identical. 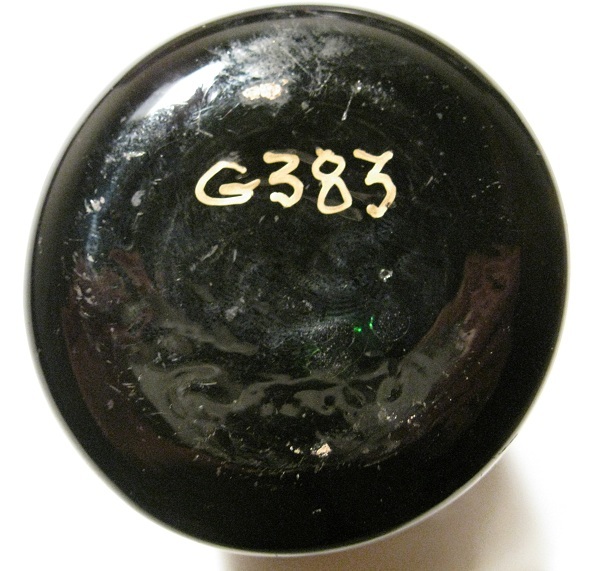 This one, I thought when acquiring it, was of a dark, “black glass,” or “yellow olive color.” Having gotten home with it, I hefted it in one hand and hefted an old black glass “Junk” or ale bottle slightly larger than a quart, and the weight was basically the same, which had me thinking it was the same amount of glass used. Now, I was thinking it made some sense that these tubular solid glass gathers could be unblown bottles. 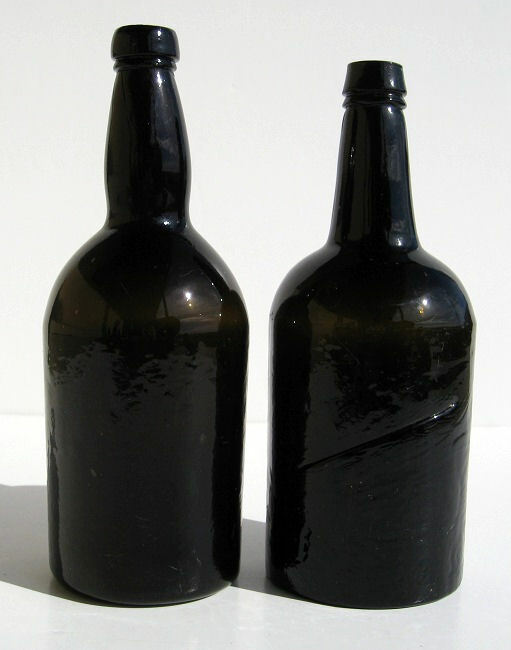 Two black glass cup blown “Junk,” or Ale bottles circa 1830. The one on the left was acquired in Missouri, the one on the right was unearthed in a privy in Columbia, Pa. Boy, was I in for a pleasant surprise. I had posted some pictures of these on the Early American Glass Page on Facebook and a very knowledgeable fellow, Charles Flint, provided some very thought provoking and factually correct information on what these pieces actually are. I’m thankful to Charles, as he was a great help and really led me in the right direction with these pieces. These are color batch ingredient pieces; the green ex-Gardner one would turn the batch green, the plug itself is a very condensed form with a serious amount of carbon, which is the material that makes green glass. But what to make of the second longer and thinner example I recently picked up? 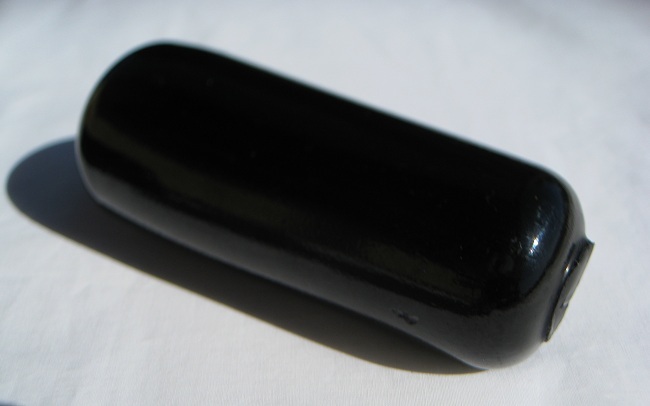 Was it a color plug for “Black glass?” Knowing from what my Facebook friend Charles imparted to me, it just couldn’t be. So I gave it a much closer look. 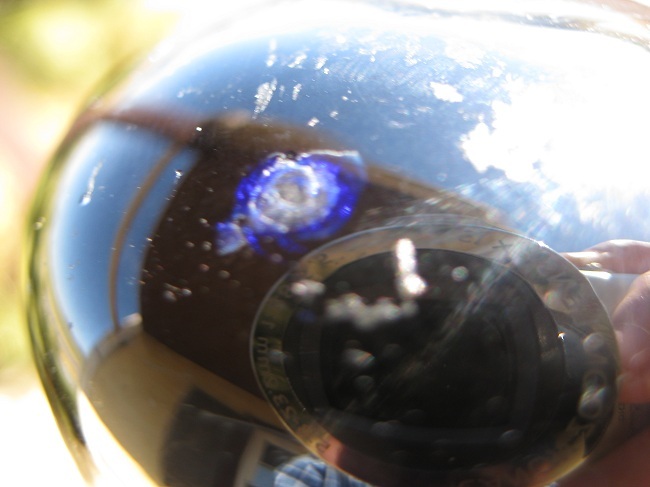 See below the piece itself and then see some close up details of bruised areas where the color of the plug is seen. 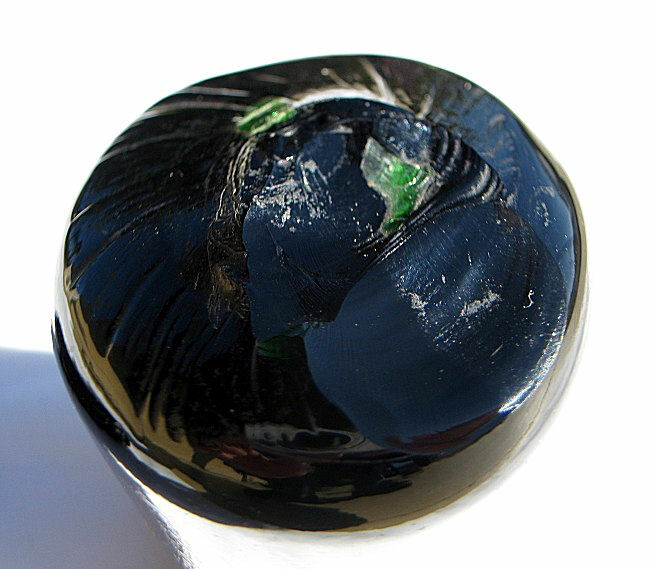 Due to the density of the plug color ingredients, one has to look closely to see what, and if, there is color apparent, due to the overall darkness of the piece. Would you look at that? It’s cobalt blue and not black glass as I had originally thought. 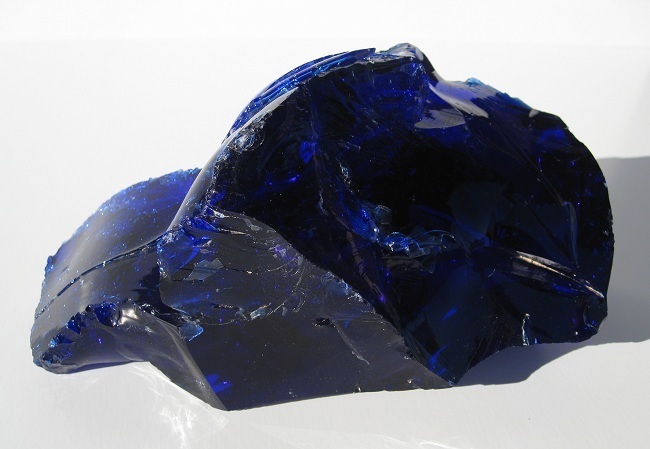 Not only that, I had also recently acquired a large “slag” glass chunk dug from the grounds of an unknown east coast glasshouse. It is cobalt and measures 7″ long by 4″ high and wide. See below; it’s a beauty and quite artsy in its random and chaotic form. I liken it to a solid piece of rolling blue sea with a cresting wave on its top. 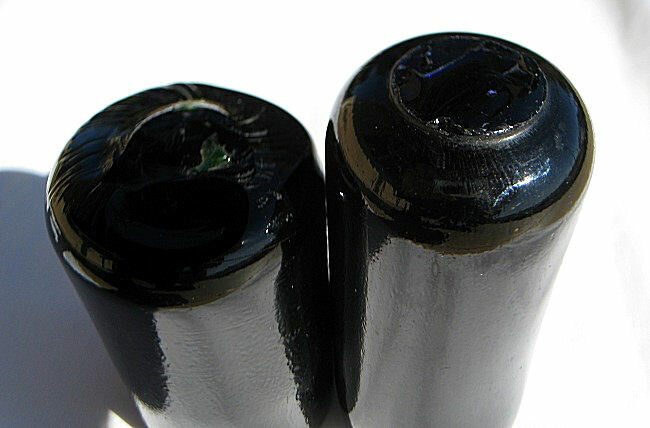 Now, in the comparison pictures below, note that one can see into and almost through the much larger slag piece of cobalt and the much smaller 4-3/4″ by 2″ color plug remains so dense with color ingredient (likely cobalt itself,) that it still appears black in comparison. 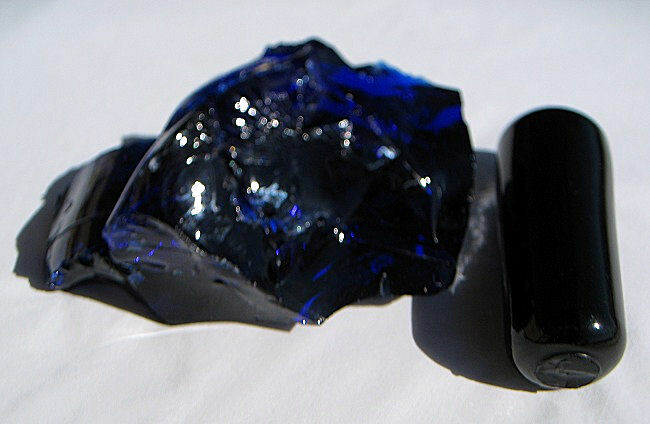 The slag piece is a rich, almost purple blue, yet transparent, and came from a glass batch that the plug would have been used to make that glass batch blue. What’s really interesting is that now it all makes sense. My previous “unblown bottle theory” was, at first thought, sensible, but I still had doubts and wasn’t entirely sure. The picture below shows the tops of these color plugs or cullets and the colors of each are quite apparent. Wait, what? A color block? Is this the above referenced color block? Entirely possible, although not proveable. But, in the picture shown below note the base and the letter and numbers painted in gold coloring on it. (Which tends to show white here.) Does the “G” stand for green? And does the 383 indicate a code of color green type? I have been told by some authorities in historic glass that Charles Gardner did not use this method when cataloging his collection and that the base marking is original to the piece when Gardner acquired it. 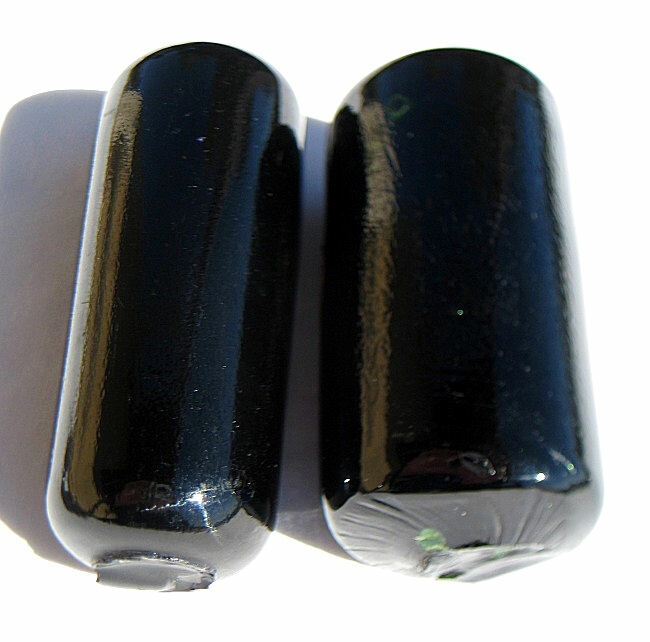 These plugs, cullets, or possibly color blocks are shown together below. The rest of that Gardner Lot was described as ‘incomplete glass forms.’ These look like complete forms to me. I love old glass. There’s always a mystery somewhere and even when on the path to solving it, more colorful little mysteries emerge in the mix. What more could a collector ask for?